Welcome to an Energy Technologies' Site. Energy Technologies, Inc. (ETI) power site covering rugged, high-reliability global UPS, Power Inverters, Solar Power, Battery Backup, Power Conditioning, Frequency Conversion, Power Distribution, Power Generation and Computer products that are the Standard used by defense, industrial and telecommunications experts worldwide. Through continuous updating and additions, we expect this site to be educational and informative on the subject of high reliability applications and the associated power conditioning and computer peripheral requirements. Rugged Power rackmount Intelligent UPS/PDU Integrated Units that combine the benefits of intelligent UPS and PDU products above into a single chassis saving rack space, cabling and installation costs. Military Power® Military Specification (Mil Spec®) compliant AC and DC UPS, DC Power Supplies, Power Distribution Units (PDU) and Frequency Converters. Mil Spec Intelligent Power Systems that combine the benefits of intelligent UPS and PDU products above into a single chassis saving space, cabling and installation costs. Airborne Power® rugged power conditioning and distribution products including UPS, frequency converters and inverters for aircraft applications. Industrial Power Source® rugged rackmount, NEMA and custom power generation, conditioning and distribution products for industrial application. Extreme Power Source™ rugged rackmount, NEMA and custom power generation, conditioning and distribution products designed to operate in extreme environments. Network Power Manager™ intelligent HTTP and SNMP managed power conditioners, UPS, PDUs and combinations thereof. Diplomatic Power® offers executives, diplomats and other world travelers with global Computer Grade power-to-go packaged in stylish, travel ready briefcases or attach�s. Mission Critical™ redundant power systems, rugged computer peripherals and drive expansion units. Personal Power Source™ a balance between economical and high-reliability in desktop and rackmount UPS units for offices or networks. Homeland Security, 911 Systems, Emergency Vehicles and Command Posts. More information can be found on the Company Information page. By popular demand, ETI has increased the Personal Solar product line to include a wider array of offerings. Starting out as solar power products for the individual Warfighter, these small solar panels, battery modules and accessories are increasing in demand for individuals use. Personal Solar now offers solar chargers ranging from units that will easily fit in your shirt or khakis pants pocket and charge cell phones, PDAs, iPods and eReaders; to models that charge notebook computers, communications gear, etc that easily fit in briefcases or backpacks. To offer better access to these products and to simplify purchase, ETI has setup an online store at www.PersonalPowerStore.com. By customer request, ETI has expanded the popular Tactical UPS and Diplomatic Power global UPS product lines to include a wider range of output power and output voltages. These portable units are compact and light enough to travel with you to any destination in the world. Their global auto-ranging AC input feature means that they can use any local grid or generator power source to produce power that matches the specific voltage and frequency requirements of your computer, network and/or communications needs. Plus, these UPS eliminate all power line fluctuations, transients and distortions; providing only pure sinewave power to the critical equipment. 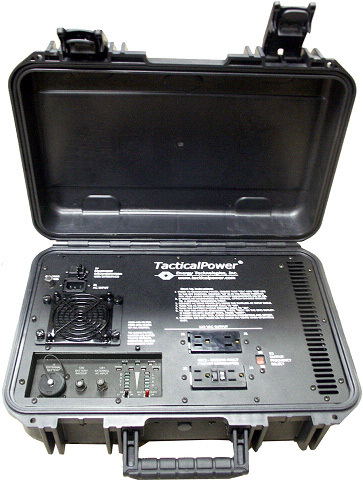 In addition, the Tactical UPS series has true global input capability by offering models with the ability to use 12, 24 or 48 VDC as an input power source (i.e. from vehicles, aircraft, etc). This gives the user the ability to use either a local AC or DC power source as input. The built-in battery module provides seamless power to your equipment if either of these sources are interrupted, allowing for the source to be restored or for an orderly shutdown. Extended battery modules are available for those applications needing longer backup times. The output power range has been expanded to as low as 250 VA in briefcase models to as high as 3000 VA in high-impact, molded cases the size of an airline carry-on with wheels and popup handle. Each model is available with either of two output voltage ranges. The CONUS models offer an output selection of 100, 110 or 120 VAC, 50 or 60 Hz. The OCONUS models offer an output selection of 200, 220 or 240 VAC, 50 or 60 Hz. All units feature full electrical isolation from both the AC and DC inputs insuring safe operation regardless of the local country's wiring practices. GFCI protection and circuit breaker protection is available for individual outlets or all outlets. For more information, go to TacticalUPS.com for first responders, military and industrial applications or DiplomaticPower.com for executive staff, government liaisons or diplomatic corps, where having reliable, quality power for computers and communications is important regardless of where your travels take you. ETI has introduced 3-phase capability for both the Mil Spec and rugged COTS UPS offerings. Having a 3-phase input allows the load to be spread evenly helping keep 3-phase systems in balance. These units are available with output power ratings from 3.0 to 7.5 kVA. Examples of current production units are the ETI0001-2205A3 and ETI0001-1488A1. ETI has teamed with Utilis USA to offer complete systems solutions for deployable shelters. Utilis manufactures a series of rapidly deployable tactical soft-wall shelters that incorporate a patented state-of-the-art folding-frame design. The basic shelters can be fully erected by two people in less than 3-minutes. By combining ETI's portable power sources, power conditioning, power distribution, office systems and shelter HVAC, either company can offer a total solution to deployable shelter requirements. ETI also offers similar solutions for ISO shelters and other rigid-wall shelter applications. The Tactical Solar Fly™ has a double energy benefit: 1. it can generate electricity and 2. it can provide solar shading. 3rd party testing has shown the the combined benefits can reduce an installation's energy requirements by as much as 40%. A new web site, TacticalShelterSystems.com, has been setup to provide information on the individual components as well as the various systems solutions available. ETI has further expanded its very popular Tactical Solar product line, now offering the most complete line of deployable solar power equipment available anywhere. Originally developed for use by today's Warfighter overseas, it equally well suited for First Responders and other Emergency Services here in the Homeland. 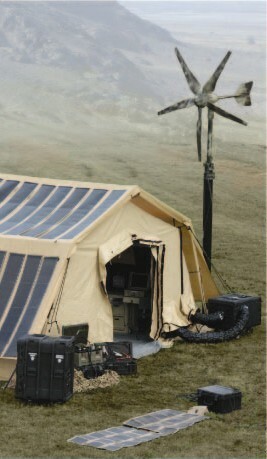 Developed for rapid deployment, Tactical Solar products include both fixed and flexible solar panels, solar charge controllers, battery modules and solar UPS systems. Units can be used to charge batteries in computers and communications gear and/or to operate the equipment directly. AC output voltages are also available. Most of these units are integrated into self contained briefcases and transit cases providing protection for the equipments as well as quick setup in as little as two minutes. Besides operating from solar panels, the same systems can use either DC power from military or emergency vehicles or any AC source available. The new Tactical Solar Fly offer up to 1280 watts of solar power for each 10' x 20' soft-wall shelter section or up to 1360 watts per 20 foot ISO shelter section. This solar covering also serves to further insulate the shelter reducing power required for heating/cooling of the shelter. More details can be found at Tactical Shelter Systems or Tactical Solar. ETI has also introduced its line of lighter-weight, quieter, Tactical Wind Turbines® which are designed to either operate stand-alone or work with the Tactical Solar products as a hybrid system. Available in a variety of sizes, the 5-blade turbine shown to the right can generate 1200 watts, yet only weighs 50 pounds. The telescoping mast is constructed of carbon fiber making it strong yet light weight. A single intelligent controller converts either or both wind power and solar power to useful power sources. The entire system can be easily setup by two people in a few minutes. More details can be found at the websites for Tactical Shelter Systems or Tactical Wind Turbines. Most products sold in the rugged market start out as desktop or consumer products (Commercial Off The Shelf otherwise known as COTS). These vendors will attempt to "ruggedize" their product to compete in the rugged market. These ruggedized COTS products usually fail due to either temperature, mechanical shock or vibration requirements since they were not designed to withstand these extremes! ETI's products start out rugged whether for COTS or full Mil Spec applications. They are designed to and meet Military Environmental Standards. ETI's products have successfully passed these tests numerous times including Mil STDs 167-1, 810, 901D plus surviving the vehicle mounted endurance tests in the notorious Belgium Block and the explosive charges in the Barge tests. In making product evaluations today, the wise decision makers base their conclusions using Total Ownership Cost or TOC. Considering all factors, ETI products have the lowest TOC due to their overall performance and reliability. Besides the initial product cost, areas to consider are Installation, Training, Maintenance, Spares and Uptime. Products such as the ETI0001-N5 series integrate features that reduce the overall space and installation costs. Defense services and support contractors are already experienced with ETI designs and the products' operation. Manpower is a very significant factor in TOC. Very high reliability means minimal maintenance, which results in minimal manpower requirements. Once the ETI units are installed, they require very little or no preventative maintenance to keep them operational over the years. Very high reliability means a negligible spare parts requirement. If spares are desired, one set per site would be more than adequate for years of operation. Very high reliability means maximum operational uptime. Since failures usually interrupt operations at the most crucial times and since UPS or PDU reliability impacts multiple downstream loads, minimizing failures or downtime is imperative. ETI has field proven very high reliability and uptime. The Mean Time Between Failure (MTBF) exceeds 250,000 hours and the Mean Time To Repair (MTTR) is less than one half hour on most ETI products!